Rule the land with this remote control mythical beast that flaps his wings as he walks. 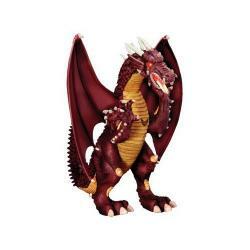 Uniquely sculpted remote control, realistic walking motion Fire breathing effects and growl, moving head and screeching roar, moving dorsal spikes, wings flap. Fairytales come to life with this wise and powerful creature. Different remote control dragons might be display at our recommended stores. Read details carefully.